I will be at the Eureka Springs School of the Arts each day this week, continuing to assemble tools and getting the wood shop ready for our first class. 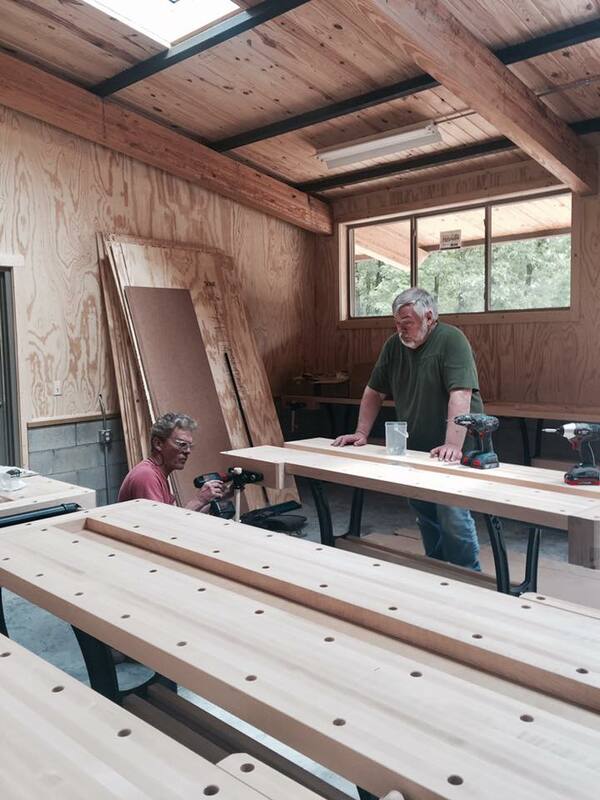 The photo shows our new work benches as they are being arranged in the bench room. As we prepare for the grand opening, I am struck by the enormity of this project, of which the wood shop is only a part. About 15 years ago, other artists and I were discussing the need that we had for an art school. We decided to build one. Not having money or resources, we decided to start as a school without walls, using various private studios in town. The purpose was three fold. Allow the various artists in town to have a means to engage others in the arts. Build the stature of the arts in a community that was already known for the arts. Preserve and protect our community, for artists are the ones who remind us to recognize and protect cultural and aesthetic values. We proceeded to build a school. At this point we have a 55+ acre campus and studios for pottery, jewelry making, leather work, painting, drawing, iron work, and with this new building have added woodworking. At this point in my own life, I am in awe of a number of things. And I am mainly reminded that people can gather together and add their strength to each others to accomplish what may turn out to be great things.The long range success of the school is not assured by any means. But our hope is that it gains in credibility, others in the community will realize its value to us, and step up in its support. I, in the course of things was lucky to recognize a few things. As a newcomer to Eureka Springs, I invited a few members of the local community to gather and create the Eureka Springs Guild of Artists and Craftspeople. Through that organization and as first president, I fell into association with a number of wonderful artists. After that organization had met and worked for many years, we closed it specifically to form the Eureka Springs School of the Arts. Put the date on your calendar, June 4, 2017. Come join us to celebrate the new wood shop. It will not be complete, as we may be fine tuning it for years. 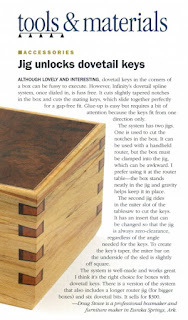 A copy of Fine Woodworking magazine came in the mail this week with a note attached suggesting I would be particularly interested in P. 22. 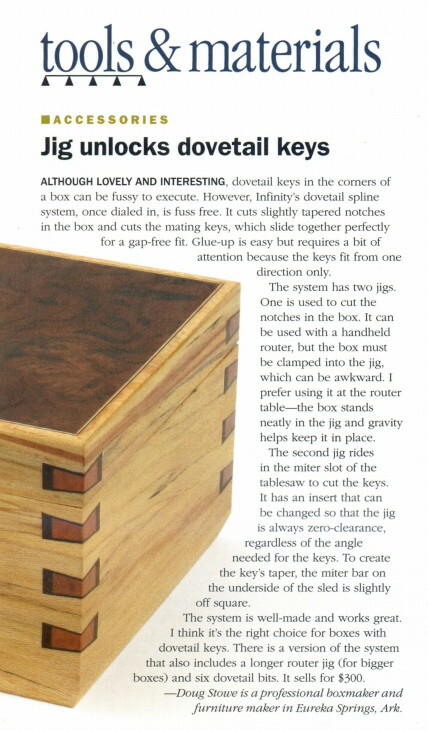 That's where (if you are a subscriber) you'll find a review I wrote on the Infinity Dovetail Spline Jig. The jig and matching sled are used to cut tapered dovetail slots in the corners of a box, and dovetail shaped tapered keys to fit the slots. If you are not a subscriber, look for the magazine at your local book store or news stand. I am home from Portland and will spend the week cleaning up at Clear Spring School, preparing the new ESSA wood shop for its opening day, and beginning to consider my first summer classes. While my box making class at Marc Adams School of Woodworking is full, there are still openings in my one day class on making Froebel's gifts number 3 and 4. Our first general woodworking class at the Eureka Springs School of the Arts needs more students and it would be a very good introduction to basic woodworking and a great chance to learn in our new woodworking studio. Under the guidance of furniture craftsman Steve Palmer, students will have a choice of making a serving tray, cheese board, display tray, bread board, cutting board or similar project. Students will be asked to pick a project, determine its size and shape, choose from a selection of woods to determine color scheme, glue up the board, cut it to size, and add details such as inlay, finger holes, edge contours, etc. Steve was great! I would like to take more classes from him. Patient, knowledgeable, experienced - can readily see he enjoys what he does! Steve has an engineer's brain which is perfect for teaching safety and being thorough about teaching proper wood working techniques. Encouraging, accommodating, patient, willing to stay late - start early. Great - Great job. I am working on my end of year conference reports that give me the opportunity to review the school year. My upper elementary class determined that they wanted to make a see saw in wood shop and following its completion a couple months ago, it was in constant use during every break, and after school. Yesterday I mentioned the idea of educational entanglement and I had written about the idea before. http://wisdomofhands.blogspot.com/2014/10/expression-as-measure-of-educational.html. 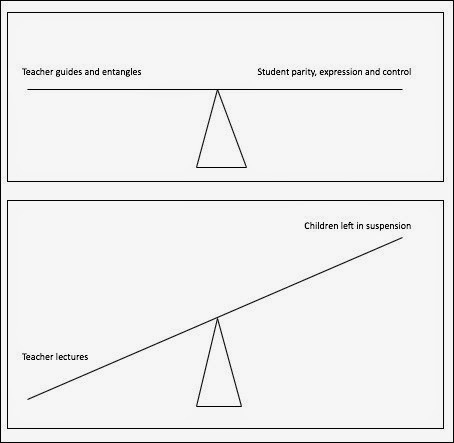 The simple seesaw in the illustration from that post shows the idea. In the principles of educational Sloyd, lessons were to start with the interests of the child. The drawing is intended to show balance. The teacher's role is to utilize the student's pre-existing entanglements to create the foundation for further, deeper and greater entanglement. Today we are leaving Portland. My wife and I fly to Arkansas and my daughter to finish her school year in New York. The wedding was lovely. This next week I'll be continuing to prepare the new ESSA wood shop for its opening on June 4. Yesterday, my wife, my sister Mary and I wandered around Portland and made our way to the Real Mother Goose Gallery, one of the finest craft galleries in the US. I saw many fine and wonderful works by many of the artisans who inspired me in my earlier days as a craftsmen. We also wandered through the Portland craft market and were amazed at the volume and quality of work. As craftsmen, the can force the wood to tell the story of our mastery over it. Or we can use our own handling of it to enhance and enable others to understand the beauty we find in it. In other words, we can go one way or the other, and it often appears as through many of us are swimming against a strong tide that's headed in the wrong direction. Last night I talked at some length with my nephew Logan who spent the last two or three years in Southeast Asia on the trail of musical instruments and performances that are endangered by the universal culture that seems to be sweeping through. He told about his passion for languages that are being lost. The quote above speaks to a sensitivity to the language of form, for language itself comes first from the experience of life itself. And as we seem headed into a non-sensual, non-sensical landscape of fingers sliding over glass, experiencing no longer the world through our hands, we need to carefully consider all things. Logan told me about the stringed instrument player, who when a string broke, went to his motorcycle and unwound one of the slender wires from his brake cable. For surely music is more important than life itself. I can kind of understand the theory of relativity, but what amazes me most is the concept of quantum entanglement. If you introduce two atoms to each other and then separate them to the farthest corners of the universe, what you do to one has measurable and observable effect on the other. And so what do the hands have to do with that? It may be too deep for a single blog post, but our hands, open or closed, held to strike or used to create, or locked together as a means of sharing our care for each other, are expressions of entanglement. Let us be entangled. In education and in each others lives. The photo shows all that remains of the battleship Oregon, except a scrap of wood (teak) used to make a frame that surrounds an etching of the Battleship that hangs in my office in Arkansas. My grandfather had given me the framed etching during my first trip to Portland as a very young man. It was a treat to stand by a part of the original battleship Oregon here in a Portland riverside park. Make, fix, create, and increase the likelihood that others are given the gift of learning likewise. My wife and daughter and I arrived in Portland last night to attend the wedding of a niece. It was late and we hoped to catch the last train to our hotel. Unfortunately, the train was delayed. There had been an anti-muslim incident in which two men were killed. Three men had intervened when an angry man was harassing two muslim women on the train. The angry man attacked, leaving two dead. One must wonder what kind of world we have on our hands. There is a relationship between hateful speech and hateful acts. And we have choices to make. Do we train the hands in service of humanity or do we clench them as fists and bludgeon each other? Those who are engaged in the making of useful beauty are too busy for anger. The party in power seems to not care one way or the other. So what's so special about wood? It’s lovely. You can craft beautiful and useful objects directly from the most basic of raw materials. It unites us with the natural world, and invites us into a profound relationship with nature. Objects whittled or sawn or shaped from it, if cared for, can last a thousand years or more. There is absolutely no limit to what you can learn from it, things even about yourself. And yes, it does grow on trees. Our Eureka Springs School of the Arts concluded our week long Plein Air Festival last night with a display of artist's works. I purchased this lovely view of one of my favorite things in Eureka, Perkins Mill. It will hang in my office when I have a bit of time to rearrange things. What you don't see in the picture is that within Perkins Mill are all the old wonderful tools, line shafts, belts and diesel engines that were used in the making of Eureka. If I had a million dollars to buy it and another million to protect it in perpetuity, I would. It is the most important structure in Eureka Springs and rarely noticed. Perkins Mill and Lumber Company was involved in much of the construction and preservation that took place in Eureka Springs for over a hundred years. It is a humble, industrial building but a symbol of creativity and meaningful labor. The painter of this work, Marty Benson, received an award as best new beginner. It is hard to believe that Plein Air painters can do such lovely work in a single day. Throughout the week painters were in town on street corners and in various odd places, where-ever the view captured their attentions. Rain or shine, We are enriched by the arts. Make, fix, create, and assist others in finding the value of learning likewise. the necessity of doing it. Today is the Celebration of the Child at Clear Spring School. In addition to music and performances, each child will be honored for their qualities that make them special in our small community. Stupidity is alive and well. There are many who think that by ignoring the needs of particular children everything will be OK. But it will not. We have terrorism in the world that can affect even the most sheltered and cherished of our kids because we have stupidity and poverty. Setze bei den Interessen des Kindes an. The point is that we've known about effective education since Comenius. And yet we appear to have chosen instead to run our children through educational canning factories as though they are cans to be filled with certain things. And the children of immigrants or of the poor and in other parts of the world? The conservative Republican attitude seems to have become, "who cares?" But we must care. Make, fix, create, and accept the responsibility of helping others to learn likewise. What you see in the photo is not good. The young woman with her shop teacher or a fellow student standing over appears to be getting ready to free hand a board through the table saw. I hope this is not the case, as it should not be. 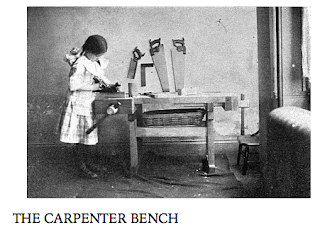 Safety requires that she use the table saw's miter gauge or a sled to make the cut. If she is using the fence to control the length of the cut, the risk of kickback is extremely high. If she is simply going to stick the wood into the blade her chances of an accurate cut are null and the risks of serious injury are high. Becoming an industrial arts teacher requires a high level of skill in two areas. First, you must have mastery of the industrial arts you plan to teach. Second, you must have expertise in teaching itself. No matter how skillful you are as a carpenter, you won’t succeed as an industrial arts teacher if you can’t teach woodworking skills to others. I hope everyone understands that teaching industrial arts requires much more than online learning. Assuring safe practices (both in teaching and making) requires actual experience. One of the best ways to assure safe learning and safe teaching is to take a class. Steve Palmer's 3 day class at ESSA would be a good starting point. This is my last day of teaching for this school year. I begin preparing for adult summer classes. Make, fix, create,and make way for others to learn likewise. I continue to study both Norwegian and Swedish using the program Duolingo. Orker du is a Norwegian phrase and according to Duolingo it means "Do you have the energy." According to Google translation it means "Do you breathe?" or "Do you work?" The Swedish phrase Orka du, according to Google means simply, "Can you?" And I must say, "Yes, we can!" It's not just because we breathe that we can, but because we do and have practiced doing until we've become better at it. Together, we can make the world a better place, and transcend the selfishness that holds us back. Yesterday the electricians turned on the lights at the new Eureka Springs School of the Arts wood working studio. I can assure you that a lot more than breathing has been going on. Now we have plumbing, and lights, and soon will be able turn on any number of power tools at the same time. We are aiming toward the opening day of June 4, 2017. Everything will not be perfect at that point, as it will take some time to put everything in tip top shape. Today I plan to go out and assemble some tools. Our first wood turning class using all new lathes and turning tools in our new building is nearly full at this time. Our maiden voyage class in the bench room and machine room will be a three day class in woodworking techniques taught by Steve Palmer, furniture maker from St. Louis. 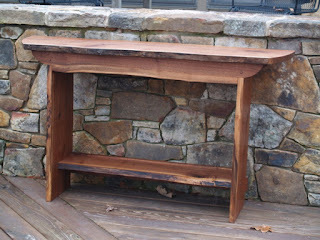 http://essa-art.org/workshops/wood/basic-wood-working/ There are still openings in that class that we hope to fill. Steve has taught before at ESSA and has received glowing reviews from his students at ESSA. His class will cover the basics of safe and appropriate tool use and absolutely no prior experience is required. I plan be there for part of it to assist. Students will carry home lovely wood art as evidence of what they have safely learned. At that time I will have just returned from classes at the Marc Adams School and will be preparing for my own 5 day class in box making. I invite you to join us. Steve's class would be a good introduction to woodworking, and woodworking is worth being introduced to. The image above is of our publicity photo for the grand opening of our new woodworking complex and for our incredible edible fundraising event on June 4. It features woodturning tools used as forks, and a Lee Valley workbench as our lovely table. The bowls holding fruit are made by Les Brandt. A while back I read an article about Marcin Jakubowski's Factor e farm in Bloomberg Business week. Jakubowski is working on "open source" mechanical equipment that can be made from readily accessible junk. I am also remembering my summer visit with Bill Coperthwaite. Both Coperthwaite and Jakubowski were driven by a goal of regaining a necessary democratic distribution of human resources. Both were concerned with the tools of civilization. Human beings these days seem to have become unfamiliar with the rhythmic potentials of our own bodies. 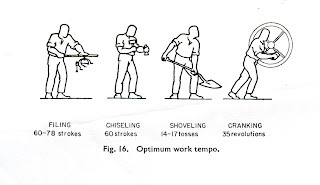 Give a kid a chisel, and he wants to drive it straight into the wood in a single whack, not realizing that work is most easily accomplished through rhythmic (and thoughtful) application of force. By dividing work into smaller increments, human beings can have tremendous power. 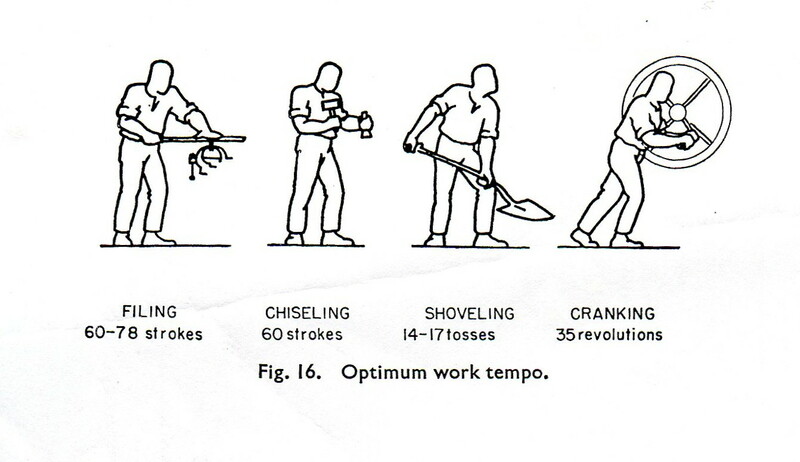 The illustration above is from Rudolfs J. Drillis' "Folk Norms and Biomechanics" and shows the optimum work tempo for man. Don't expect others these days to make such observations or to be interested in such things. We have reached the point of foolishness in which human labor and the productive capacities of our own bodies are things to be escaped rather than studied and cherished. I am finishing my school year at the Clear Spring School and preparing for summer classes. I've a lot more to do to prepare the new ESSA wood shop for an opening celebration, June 4. Larry, Sam, Ken, Buz, Mike, Suzanne, Bill, Steven, Les, Cliff and Dan. With these volunteers I spent the day Saturday, cleaning the new wood shop at ESSA and assembling our new work benches and various machines. Even with a dozen of us at work, we still have more work to do. But I was amazed and pleased at our progress. I may be able to work a bit more on Tuesday and Wednesday of this next week. Outside the shop, we've accumulated a huge pile of cardboard. Pictures of our work day are on our ESSA Facebook page. My thanks to all the volunteers. It is a remarkable thing to be a part of such a fulfilling enterprise. Today is Books in Bloom, the small town literary festival that my wife founded with friends and the Carroll and Madison Library Foundation. Last night at the Books in Bloom author's reception I talked with a friend who works with "Gifted and Talented" students. I was curious about the means used to identify those students who fit the program. It is my own belief that almost all children are gifted in special ways and that their gifts deserve to be recognized within schools. That does not happen often enough in schools designed from the outset to run students through in large numbers. As much as I admire all teachers, we can use reading as an example to explore the system at large. In the US we begin applying pressure to read in Kindergarten. In Finland, students begin reading in second or third grade and by the time they are tested in the international PISA study, they far surpass American readers in 30 percent less time. And so what do Kindergarten, first and second grade teachers in Finland do instead of making their students read and do homework? Perhaps they are helping to identify and awaken their students' many and diverse gifts beyond those of reading and math. Make, fix, create, and improve the chances that others learn likewise. 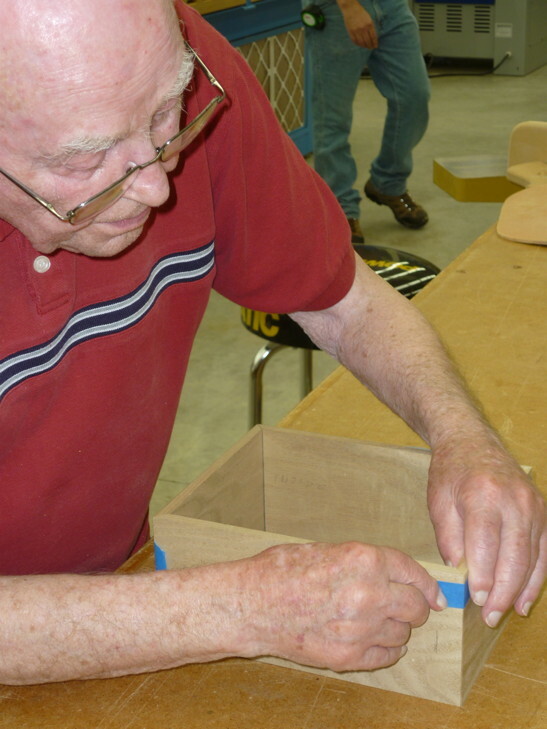 Today at the Eureka Springs School of the Arts, volunteers will be helping to assemble workbenches and machines as we prepare for our opening day celebration, June 4. There is a lot of work to do. But willing hands make work a joy. Yesterday I had my most successful White St. Art Walk ever, thanks to having sold a walnut hall table and a number of books and boxes. I faced a continuous stream of old friends and familiar faces throughout the evening. 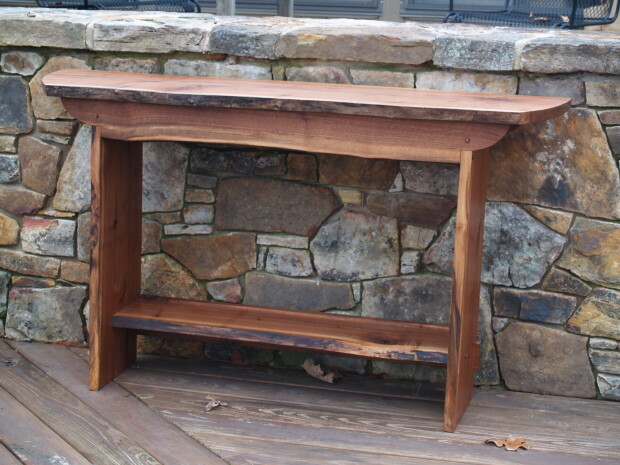 The hall table was made for my book Rustic Furniture Basics. It is on sale, so use the discount code SPRING20 at checkout. 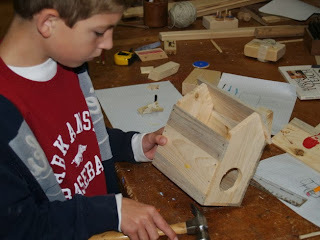 There seems to be a growing interest in our Wisdom of the Hands Program of Woodworking with Kids. That's a good thing. The idea is simple. The use of the hands facilitates learning and remembrance of learning. To observe the hands and what they create provides a sincere and truthful measure of character and intellect. When children are given the opportunity to measure their own growth through what they create they need little adult interference. Given tools and guidance we can watch them joyfully create. Last night some attendees at White St. commented on all the things I do. I write, I make, and I teach. My excuse is that it all revolves around woodworking, and I need to do only one thing at a time. Make, fix, create, and give a lasting gift to others by helping their hands learn work. A friend, Les Brandt is a wood turner who will be teaching our first class in the new wood studio, and he volunteered to do research among wood turners concerning lathe tool holders. Ironically, he sent me the photo here which I recognized as being my own, made years ago for the Clear Spring School wood studio. The thing I like about this design is that the tool is held in such a way that the tip can be observed. It must be wall mounted high enough that the points of the tools present no danger.The design also relies on a French cleat. One angled piece is affixed to the pipes, and the matching angled piece is attached to the wall. The rack is easily removed so it can be put away when the lathe is not in use. 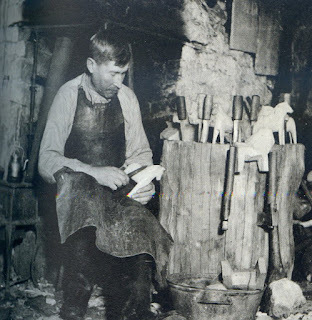 A wood turner had found the image on Pinterest, and thinking it a good idea, had saved it. I had shared it on the internet sometime in about 2002. The arm in the photo holding the tool holder is indisputably my own. The collection of tools in it belongs indisputably to the Clear Spring School. So, it is extremely funny to have chased around the internet for ideas, only to be directed home to my own shop. The idea of using PVC pipe to hold tools is not originally my own, but my own simplification of the idea using seems to have inspired others, and has come home to roost again. A friend said, "full circle." Yesterday I took a walk through of the new ESSA wood shop with the architect and contractor to go over final details. Today I have White St. Art Walk where I will be selling my work at Lux Weaving Studio. The White St. Art Walk is one of the premier arts events in the state of Arkansas. Come see me and enjoy the works of many of our fine artists. Buy things. Your money can support the arts. Tomorrow, Saturday, May 20, volunteers will join me at the new ESSA wood shop to assemble woodworking equipment. I repeat myself for three reasons. Readers of the blog are constantly changing. The same exact points remain pertinent. By repeating myself, I have hope that my message is refined to the point that it cannot be ignored. It's a lot like making boxes. Your first won't have the same level of refinement as your second, and by the thousandth time repeating myself, I hope to be crystal clear. I was talking with a robotics teacher yesterday, and we know that robotics are all the buzz. Kids and parents are excited about the subject. It's new and exciting. But he's found his students have no idea of how to use a screwdriver. They've held complex objects their whole lives but without ever having developed the necessary skill or curiosity to take something apart. So here we go again with the principles of educational Sloyd one-more-time (it will not be the last). These days all things have become screwed up in reverse order. Parents put technologies in their children's hands that they have no way to understand. Children can manipulate what an iPhone shows on its screen, but have no idea what exists at its heart, and no way to control its actual impact on their lives except as consumers constantly in search of newer and more of the same old thing. This may sound like I'm attacking technology. I am not. If you read the principles of educational Sloyd and understand them, they came to us one hundred years before Jerome Bruner developed his concept of "scaffolding." We throw children willy-nilly into advanced technologies without providing the scaffolding for them to become masters of it. So, is there a place for wood working and woodworking education in the world of the iPad and fingers sliding over glass? I call for all hands on deck. We need whole persons to inhabit and protect our lovely planet. We need whole persons to make lovely and useful things that continue to express the heights of our humanity. Do we need more robots working mindlessly, or do we need thoughtful human beings to whom we may entrust the sacredness of life? American politics are bonkers. We have Trump in the white house. Daily, he proves himself to be inept and uncaring. Even conservatives are starting to get the picture. Republicans in Congress remain silent for the most part. Trump serves them proudly as a wrecking ball to destroy all the programs that they do not like, ranging from environmental protection to protection of health and family. But as long as he's doing the dirty work to fulfill the Republican agenda, the Republicans in Congress appear to tolerate every conceivable outrage that Trump can muster. In the meantime, there are good things to be done. The making of useful beauty in an age of imports and cheap stuff is in some ways an act of defiance. It's moving against the flow of destructive force and directly into the million+ year heritage of human kind. Perhaps this blog should be a politics-free zone, where we can escape what ails us as a nation. But to create useful beauty is a political act. To do so not only shapes the world around us, it shapes our own hearts and minds as well. And so I console my readers in these difficult times, and urge that we take matters and materials into our own hands. Let's preserve and protect our planet so that our greatest grandchildren imaginable and even the least among them will know its beauty. And let's use our hands and hearts to set an example. There are big things afoot in Washington, DC in which the whole fabric of our nation is being sorely tested. But, again, I repeat myself as I always do, When we make useful beauty, we transform the world around us, and ultimately to the betterment of all. This is a busy week. Yesterday I made a trip to pick up tools. Today we unload those tools and begin moving them in place. I also will begin setting up for the White St. Walk in which I hope to sell some of my work. Today and tomorrow I have phone calls with schools that are interested in the Wisdom of the Hands philosophy. Make, fix, create, and defy the odds. The first of the chosen quotes is from Maria Montessori. The second from Albert Einstein. That the author of the article chose to leave the important point as questionable by use of the word "may" is absurd. (the emphasis in the quote is mine) In fact, I am willing to go so far myself as to state that even adults learn most efficiently through play, and that it's our most effective means of feeling and expressing our own creative power. But then perhaps in a world moving toward authoritarianism, personal creative power is of least concern. Here in the US, we are moving rapidly toward a constitutional crisis as the Trump presidency proves to be as inept as many of us knew it would be in the first place. The conservatives are seemingly pleased to keep backing Trump as he serves as their convenient wrecking ball to attack the EPA, and social programs in the US. He does the things that they want to do but are fearful of doing themselves. But he will keep doing stupid things until even the Republicans lose tolerance. The question of course is what price we will pay. In the meantime, and on a more personal level, to make things of useful beauty is an act of resistance. While much of the world is enamored with Trumpian grandiosity, to find simple pleasure in the work at hand is a wholesome thing, that benefits our families, our communities and nation as well as our sense and state of mind. As craftsmen and makers in America, we persist and we resist. Today a good friend of mine and I will pick up and deliver more tools to the new ESSA wood shop. The photo above is from a class of mine at Marc Adams School of Woodworking. Even adults of advancing age learn through play. Wood shop teachers have been busy throughout the year coming up with useful ideas. The sanding bow above is one from shop teacher David Shinnlinger. It can be used on the lathe or hand powered to shape wood. A similar sanding bow by Australian wood shop teacher Richard Bazeley uses sanding belts from a portable belt sander. Take a 4 inch wide belt, tear it into 1 in. wide strips and away you go. Sanding seems to be the part of things that many woodworkers find least enjoyable. The dust is messy. If yo do it by hand, effort is required. If you do it by machine, it's easy to mess things up. It was frowned upon by the adherents of educational Sloyd, as it hid the underlying tool marks that were evidence of careful labors and skill. It is also a bit of a pleasure as wood transitions from coarse to smooth but you have to pay attention for that. To see (or feel) a finely sanded surface tells you something about the maker of the object. That he or she cares. An article in yesterday's Arkansas Democrat Gazette described the growing rift between two factions of the "school choice" movement. One (supported by billion dollar foundations) and another (also supported by billion dollar foundations) are arguing (by spending real money) whether "school choice" should be provided by vouchers or by charter schools. Neither faction pays any attention to the one principle that could truly reform education. Start with the interests of the child. Today we have a delivery of machines for the new ESSA wood shop's machine room. The lathes were delivered last week and have a lovely room of their own. I have classes this morning and afternoon at the Clear Spring School, and we are rapidly approaching the end of our school year. the flexibility of the brain. Parents of young children will have noticed how quickly and easily they learn. Things are not so easy for those of us who are a bit older. Our friend Kari from Norway visited earlier in the week. I told her that I'd been studying my Norwegian for over 370 days using Duolingo, but when she asked me to say something, I was tongue tied and nothing intelligible came out. We know that second, third and even fourth languages are easy to learn if you are within a certain age range, but that the brain does not work with the same ease in acquiring language if you have passed beyond that range. That doesn't mean that a second language cannot be learned, but it does mean that much more effort must be applied and you may never get it as well as a young child might. I am clearly over the hill when it comes to picking up new languages with ease. "The small muscles of the eye, ear, larynx, tongue, and hand have much higher and more extensive intellectual relations than the large muscles of the trunk and limbs. If you would attain to the full intellectual stature of which you are capable, do not, I would say, neglect the physical education of the hand." This article http://theconversation.com/brain-imaging-modern-people-making-stone-age-tools-hints-at-evolution-of-human-intelligence-77231 sheds some light on isolation of function between the various centers of the brain. As researchers performed certain tasks in making stone tools, those who had received verbal instructions rather than just visual instructions were reliant on parts of the brain that processed verbal instructions, while those who learned without verbal instructions were not using the verbal processing area of the brain at all. Just think of the brain as a huge multidimensional resource. The way we teach too commonly in schools now with children sitting at desks is a near complete waste of most of it. And if we want our children to be well rounded and fully capable in all that they wish to apply themselves to, we would have a desk burning party and give students at all levels real things to do in service of their families and communities. The best way to observe and measure the engagement of the child's mind in real life and real learning is to put the hands in service of it. The hands and mind are an instructional device through which the child can not only observe the world, but test his or her own power in changing it. The hands and their behaviors are also a means through which we can measure their learning and intelligence. So how do I propose we put the hands at the center of learning? There are lots of ways. Laboratory Science, Instrumental Music, hands-on math, field trips, gardening, internships and more. And let's not forget wood shop. Yesterday we had a workday at the new ESSA woodshop. It is a lovely space, as you can see. Make, fix, create and increase the chances that all learn likewise. My readers may find this article on stone age tool making to be of interest. Brain-imaging modern people making Stone Age tools hints at evolution of human intelligence Anthropologists have long wondered about the evolution of human language and its relationship to enhanced brain size over the brain sizes of earlier man. The idea some have had was that language was the driving factor in the development of human intelligence. I and some others believe the development of man was a hand thing: That as our hands and brain co-evolved as a learning system, the capacity to communicate grew as a complementary system. In the research described, subjects who had been taught to make stone tools were fitted with brain imaging technology called functional near-infrared spectroscopy (fNIRS). As the subjects made stone tools, the technology allowed researchers to observe which areas of the brain were active in the process. I hope my readers find this as fascinating as I do. I believe the research offers insight into an important question. "What role did the hand play in the development of human intelligence?" As we better understand the relationship between hand and brain, and how we evolved as human beings, a light is cast on the importance for us to learn all things, hands-on. Even literature is enhanced and made more real to us when we've done real things. Today is a volunteer day at ESSA. Several of us will apply moldings at various places in the new building to help push us toward our opening day. We will complete machine room benches, clean once again, and build a plywood storage rack. The image above is a test model plane made by one of my high school students. It did not fly very well, but it was so beautifully made that I thought a stand would be a nice thing. As a small gift in recognition of his good work, I made a stand for it so that he can display his work proudly on his desk. Make, fix, create and increase the likelihood of others learning likewise. Yesterday 9 Robust lathes and a Oneway were delivered to the ESSA wood shop. The Oneway is placed in the teacher position and the Robust lathes will be for student use. Brent English personally delivered the 9 Robust lathes from Wisconsin and the Oneway was delivered by a local craftsman who sold it to the school. We had volunteers on hand to assist with the moving. We also began making moldings that will be used to cover seams in the plywood walls. We made hundreds of feet of molding using the carpenter's table saw and my small router table clamped to a work bench. The moldings are a good way to use the narrow strips offcut from trim pieces used to case the many windows in the shop. So by applying trim we'll make the shop just a bit more beautiful, and waste less in the process. It is an amazing thing to see the wood shop moving toward its finished form. More power tools will be delivered next week. A volunteer asked me about our tools selection strategy. It's my belief that students should learn on tools they can afford to buy for themselves. This does not mean cheap tools. 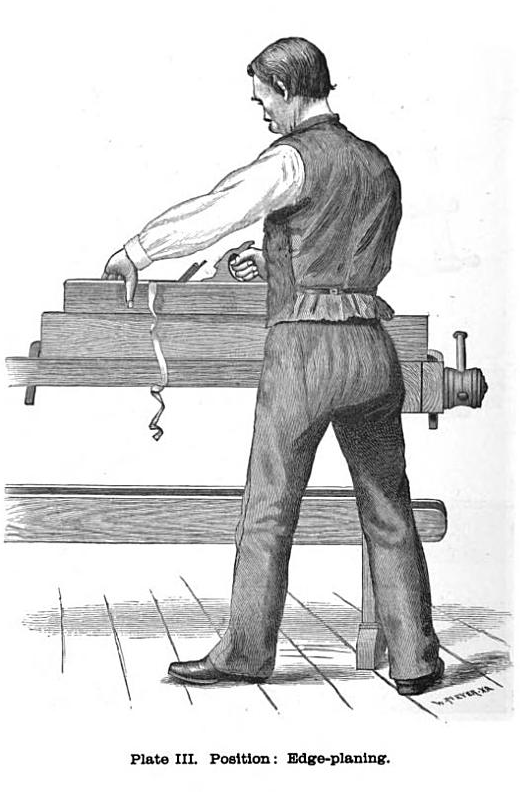 But a great lathe, and a good bandsaw can be purchased for less than what a young man or woman would squander on much less important things. A great lathe and a good bandsaw can keep a person making beautiful and useful things for family and community for many years to come, and grow in character and intellect at the very same time. Today 10 new lathes will arrive at the Eureka Springs School of the Arts and my own life appears to be surrounded by them. I have one of them in my own shop, 6 in the Clear Spring School shop and a total of ten will be delivered to ESSA this morning and afternoon. We will possibly have more lathes available for student use per capita than any other city in the USA. I went to see a locally produced play last weekend in which one of my former students had a big part. As we visited afterwards he told me that in college other students would come into his room to play with the collection of tops he had turned in school and that he kept on his desk. His fellow students were fascinated by the tops as most had never had that kind of chance to create. He and his brother recently purchased a lathe and plan to get started turning again. I urged them to come to ESSA for classes, and I am beginning to see it as my duty to allow my former students opportunities to sustain the interest they discovered in school. I have my own small collection of tops that are kept near my desk. These are kept in a small cherry bowl turned by my uncle, Ronald Stowe. My uncle had become an avid woodturner and would bring bowls he had turned to family reunions to be distributed among family members. Each and every man, woman and child would be given the chance to select one or more pieces Uncle Ron had turned on the lathe. He and members of his club would go to Arrowmont each year to receive instruction from one of the great wood turners. I am excited that our own new studio at the Eureka Springs School of the Arts will serve in the same manner. Today my wife begins a three day class with the Eureka Springs School of the Arts (ESSA) in mosaic. I will be helping to make some moldings for trimming the new ESSA wood shop, and it will feel good to have my hands in things. The work benches arrived from Lee Valley yesterday and will be ready for assembly by a team of volunteers as the carpenters are nearing the completion of their work. The image above from Swedish Wooden Toys (Yale University Press) is of a Swedish child ready for imaginative play, 1918. The horses in the photo are particularly fine. Just as real horses come in a variety of shapes and sizes, these show that the carving of Dala horses needs not be overly distorted by meeting standards of appearance and size. The cart and trappings are also intriguing and could be made by a parent or grandparent and child working together in the wood shop. Play is the means through which the child prepares him or her self for real life. Play is the most natural way to prepare children for their futures, and yet there is a distorted notion in American education that schooling should be like work, and that work at best is torturous, and that torture is a requirement for success. Let's think just a bit about joy... About the joy of creativity and discovering that work can be joy... as easily as learning can be joy, and play can be joy. Yesterday we met with folks from A+ Schools and are hoping that organization becomes a means through which we can share more of what we do with others and improve what we do as well. Make, fix, create, and increase the opportunities for others to learn likewise. The more you do, the less they learn. That's as a general rule of thumb when it comes to preparing materials for children to do woodworking. But on the other hand, children these days have little left to their imaginations when it comes to toys. Toys are engineered for them by excellent designers and fabricators, and sold cheaply at Walmart and every grocery store in the US. But what could be more lovely than a toy the child has made, or that has been made for him or her by a loving parent? The legs are long and the arms short, but even an adult can see what it is. 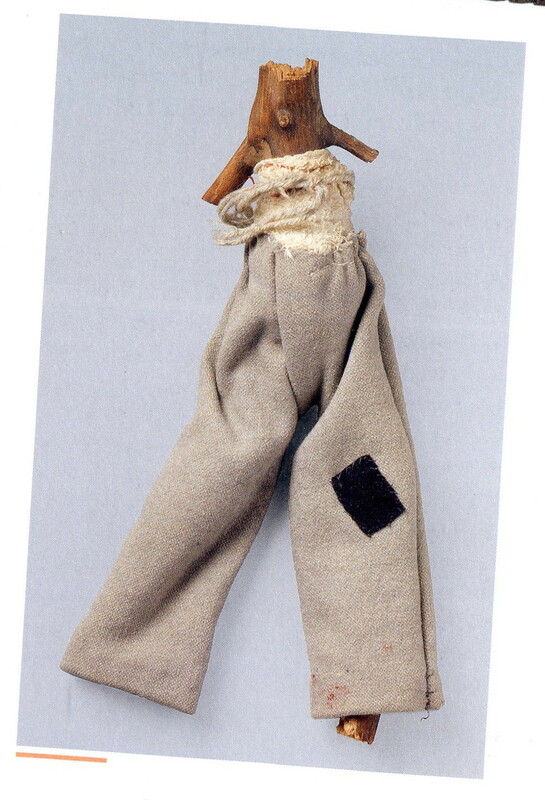 In Swedish you would say, "Träpinnen har på sig byxor," meaning the wooden stick is wearing pants. The image is from Swedish Wooden Toys, published by Yale University Press. Today the work benches will arrive at the new ESSA wood working studio. My elementary school students are camping, and we will have visitors at the Clear Spring School from Arkansas A+ Schools, a program to re-integrate the arts in public schooling. Make, fix, create, and give our children the tools of imagination that schooling deprives them of. 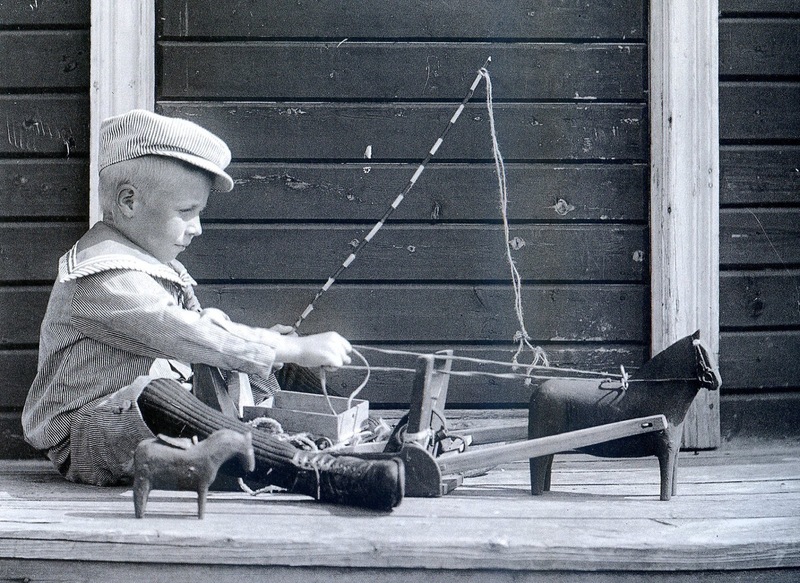 I have been reading a book on Swedish Wooden Toys published by Yale University Press. It is a lovely book recommended by a friend, and I believe it will be useful and inspirational in the toy making done by the students at Clear Spring School. Some of the toys in it are made by children or could be made by children and those are the ones that I find most appealing. The Swedish peasant woodcarver in his cottage is making Dala horses, that have become a world wide symbol of Sweden. The array of knives kept sharp and at the ready are Mora knives, from the area of Sweden that is famous for making Sloyd knives. In farming families, unpainted, rough carved wooden toy horses ere usually personalized, their appearance dependent on the manufacturer's skill and creativity. Not surprisingly, wooden horses from the eighteenth and nineteenth centuries do not have standardized shapes or sizes, because craftsmen established their own models. Some of the more ambitious carvers might be considered artists in their own right, but mostly these were itinerant carvers who were paid by the piece. From these individuals, the trade in decorated horses developed. Entire families carved to support themselves, while larger producers cane to specialize in particular styles. The carver in the photo above was Majt Jerk, Mora, ca. 1900. Bob builds lathe tool stands. We had our second volunteer workday at ESSA to prepare the new woodshop for classes. We do not have electric power in the building as yet, but with the help of extension cords running from the blacksmithing studio we were able to build tool stands, tables for grinders, install lumber storage racks, and assemble a saw stop table saw. I am grateful to those who have made this new wood shop possible, and to those also who have volunteered to help. Workbenches were delayed by the shipper and will arrive on Tuesday. Lathes come on Thursday. Our opening day celebration will be June 4, 3-6 PM. Adults are very much the same. Figuring out the benches and arrangement of them and how to make them from construction debris was a bit chaotic. The start up of any new thing is like that. And preparing children to become adults in the world is not a matter of filling their heads with knowledge derived from past exercises, but to get them to look and see, and participate in what is. Yesterday I had a small team of woodworking volunteers to begin preparing the new ESSA woodshop for classes. We began by cleaning and hauling out construction debris and sorting through useful scrap and then began building supports and storage for various tools along the north and west walls. We will continue that today. The work benches will arrive from Lee Valley on Tuesday, and I received word from Woodcraft that turning tools are being shipped. Other important power tools will begin arriving a week from Monday. While our tool storage stands are not the finest craftsmanship, we've been able to build them quickly using scrap 2 x 4's that were salvaged from crating materials used to transport the metal roofing to the site. Students of all ages, pre-K through grave, need the opportunity that the hands provide. Our need to be engaged in learning through doing real things, is essential. I thank our volunteers for helping the new ESSA woodshop be ready to serve. I spent so many years making my living solely from the making of wooden objects. I would ship things I had made to over 30 galleries across the US, and was always waiting for a check to arrive from one, and always hoping for more orders, and I can assure you that the life of an independent maker in the US is not a easy one. Last night I dreamed that I needed to come up with some new project ideas to excite my market. And perhaps something will come up. I have all kinds of great ideas but the challenge is to find simple ones that can be easily made and that have significant perceived value. Perceptions of value are based on several factors. One is the usefulness of the object. Another is its beauty. Another has to do with the materials from which an object is made. Another has to do its scarcity in relation to its desirability, and the sense of sophistication it might confer on the person who buys it. And another has to do with perceptions that one might have regarding the perceived difficulty in making. Bringing all those things into balance is a challenge because the maker also has to work with sufficient efficiency to make a living and a life from the process. Writing and teaching have helped me in that I've not been quite so concerned about the efficiency of the process as money comes in from other sources. That gives me the opportunity to reflect from a bit more distance than would be the case if I was to worried as I once was whether some small check would come in time to help me pay the bank. All of this I hope helps to describe what it takes to be a craftsman in America – to compete head to head with the mountains of manufactured things, that nearly overwhelm us. Coming up with ideas for things to make is easy. What's not so easy is finding ideas for things that can be efficiently produced with a market in a world that's preoccupied with virtual experience and cares too little for the virtue of making and owning beautiful and useful things. And yet, the need to make and create in tangible form calls out to the soul of man. Today I will have volunteers in the ESSA wood shop. We will clean. We will build, and we will work toward having the shop ready for its first classes. Make, fix, and create. See to it that others have what they need to learn likewise. Today in the wood shop at the Clear Spring School, my high school students will be finishing various projects. They were out for over a week due to travel school, and some of their projects had been put on hold to make and complet their travel journals, so now it is time to wrap up and get done what we can before the end of the school year. In addition to wood shop, I'll also spend about 45 minutes introducing my students to ESRI, a story mapping program that we hope to be better able to use in the coming years. ESRI enables you to create maps of your own that can help to share the information that's important to you. For example, a map of our local springs would be useful to both visitors and landowners. For the study of history or the environment and, video interviews and photograph scan be linked and coordinated with points on the map. The point is that learning should take students out of doors, into the field of study where it becomes linked through all the senses. The smart phone carried out of doors enables the student to link directly to the map, and the story of the student's place in the world. In the image above, Anaxagoras holds what appears to be a model of the world even before the earth was known to be a sphere. He was the pre-Socratic Greek philosopher who said that "Man is the wisest of all animals because he has hands." 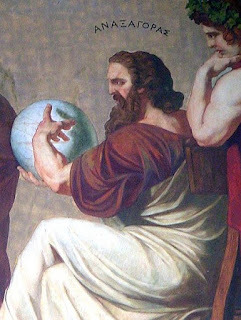 Anaxagoras also believed that "in everything there is a share of everything," foreshadowing Froebel's concept of Gliedganzes or inter-connectedness. In a similar vein, The following is from Dr. Matti Bergström's book, Hjarnans resurser — en bok om ideernas ursprung "The Brain's Resources — a Book about the Origin of Ideas." My box guitar book is proceeding nicely through the editorial process, and a number of instrument makers have submitted great photos of their work for a gallery section. Make, fix, create and increase the opportunities for others to learn likewise. Tiny turtle and new wood shop. We have been waiting for the final days of construction at the new ESSA wood shop to know what money we have available for acquiring tools. The budget became clear enough yesterday that some of the essential tools will be ordered today. This is exciting for me, as I know that many students will learn and grow in the new shop. We will have our first volunteer work days this weekend, as we assemble work benches, and build stands for various tools. Today in the Clear Spring School wood shop, students will likely continue making super heroes and working from their own imaginations. Our middle school and high school students are working on a dramatic performance of our community wide battle against SWEPCO that some of my readers will remember. I was one of the leaders in a movement to stop the electric power company, SWEPCO, from building an unnecessary and unwanted extra high voltage powerline through our community. One of the proposed lines would have run through the woods 75 feet from my deck. 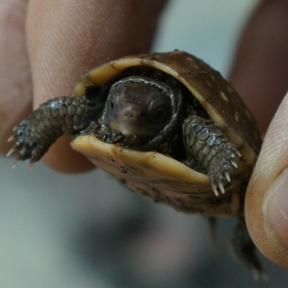 The tiny turtle that I found outside my shop became a symbol for me of all the wonderful tiny creatures that cannot be seen from the seat of a bulldozer, from the windows of a helicopter or from the corporate boardroom. There are lovely things underfoot in the world, and we and our children can learn to act in sympathy and harmony with such things. Make, fix, and join in the creative forces of the universe. Yesterday my first, second and third grade students were delighted to continue making caped superheros. Even the tiny piece of scrap wood cut from between the legs becomes something of use in their imaginations. I neglected to take photos of their work, so you will have to take my word for it. Last night, my friend Jim who with his wife hosted our Wisdom of the Hands event on Sunday, called to discuss the party at his house. He thought my message was so powerful and compelling that he wished we had a way to take it to a larger audience. I agree. At the event he asked a challenging question. "Who will take your place in the Wisdom of the Hands program when that time comes?" I can assure you and I can assure Jim, that the hands are bigger than us all. We can narrow our minds, but we cannot narrow the role that the hands play without narrowing our minds, and suffering the consequences. If I am not successful in bringing a larger audience to the hands, others will do so and must do so because the future of humanity depends on it. And I am not alone. My good friend Frank Wilson calls us his hand tribe. The video embedded in this blog link tells a bit of the story. But then the question, how do we carry on? And how do we make this message heard and understood by a larger audience? We will do so. It may be up to you (in part) to figure out how. The new ESSA wood shop is nearing its completion. So I meet today with the school's ED to begin the process of ordering tools. Yesterday we held a successful Wisdom of the Hands Fundraising event. 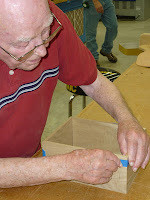 Two of my students helped adults do woodworking, and the photo shows one helping his dad. I took parts for making super heroes and letter holders and adults made both. Some adults were too shy to do the making, but all were impressed by my teaching staff. I sent an email to Patrik Sheinin at the University of Helsinki asking if he would help me with a research project. In the past I asked if he could secure evidence that Educational Sloyd played some distinct and measurable role in the Finnish Educational Success Story. Patrik at that time in addition to being dean of the University of Helsinki School of Social Sciences was head of the international PISA study. I have come to the conclusion that my research request was too narrow in scope, and research into the value of hands-on learning would hit pay dirt. I hope to hear back. What we do here at our small school is quite large in that other schools, too should engage their students hands-on. If educators have not noticed the role of the hands in their own learning, I suggest they pay attention. As I told our guests at yesterday's events, the hands are more than useful tool. They are the symbol of the skilled and totally engaged man. When the first mate calls for all hands on deck, he's not asking for desk slouchers and shirkers of work. And when the superintendent asks that all teachers and students hands be engaged in learning, we might thus save the ship. In other words, addressing family poverty would be one issue that the conservatives in Washington refuse to address. Diane Ravitch notes yet another charter school chain being under federal investigation. The administrator for 9 schools in the district was being paid nearly half a million a year... as much as the superintendent of the whole Los Angeles Public School system. It is unfortunate that the charter school system has offered a model through which businessmen are attempting to cash in and take advantage of the poor. In the meantime, putting the hands to work in learning is what we all know works. Let's do it. Make, fix, create and increase opportunities for others to learn likewise.